There is an old saying "The clothes make the man." This is based on the premise that you can judge a man's character based on his clothing and appearance. Whether or not this is true, people will often judge you according to the way you dress — if you dress for success, you will be successful is the often-heard mantra of both career mentors and fashion consultants everywhere. The "dress for success" wardrobe, be it achievement at work or happiness at home, requires a successful closet — That is a closet which is well organized and optimized for the garments stored within. 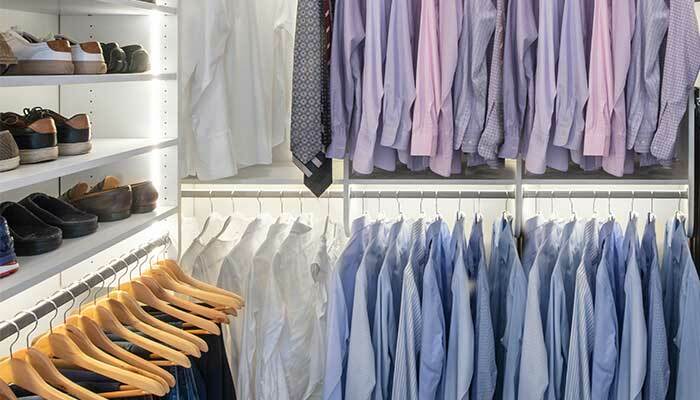 There are essential differences between organizing a closet for a man's wardrobe versus women's attire due to the type of clothing and accessories that need to be stored in the space. Men don't need as much space for long hang items as women do. Their shorter items, such as shirts, however, are often longer than similar articles of clothing for women. Underwear storage requirements are certainly different as well. Additionally, there will be specific "man accessories," like neckties, that simply don't appear in a women's wardrobe. Men's closet with double hang closet organizers and no long hang sections. Long hang is a section of closet organizer that is 62 - 65 inches in height with a single closet rod. This types of closet organizer is typically used for long dresses and jumpsuits. 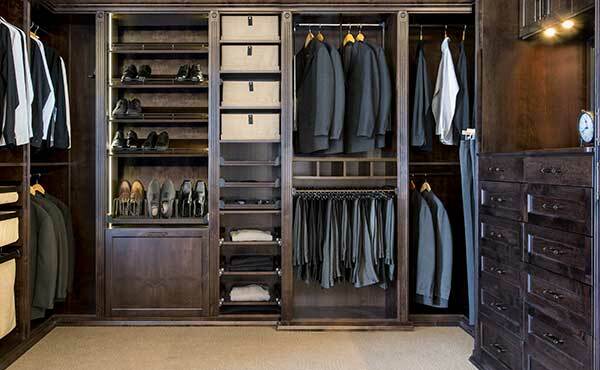 Most men don't need any long hang areas in their closets. Unless the man owns a lot of bathrobes or keeps his trenchcoat in the bedroom closet, there simply won't be much to store in a long hang section. 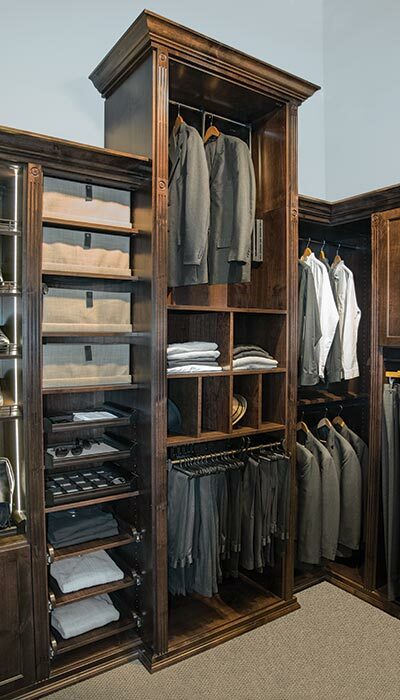 It is better to incorporate extra double hang areas in a man's closet. 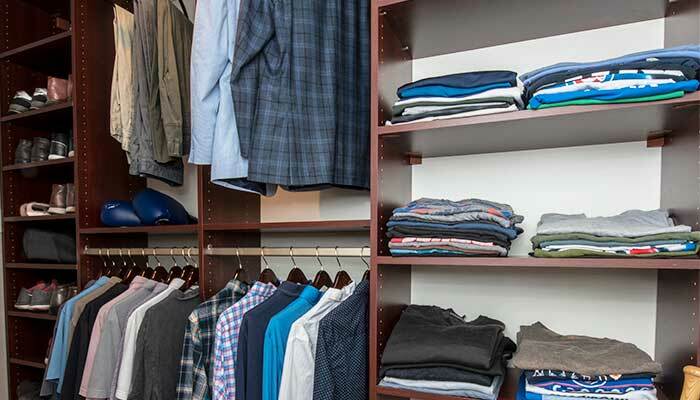 With the exception of knits that belong folded on a shelf and pants hung by the cuff or waistband, virtually all men's clothing can be hung using double hang closet organizers. This will allow for the maximum storage in the closet space. Use a hook for the bathrobe. Men's clothing is generally longer than women's clothing. Be sure that each double hang section of closet is at least 42 inches in height. 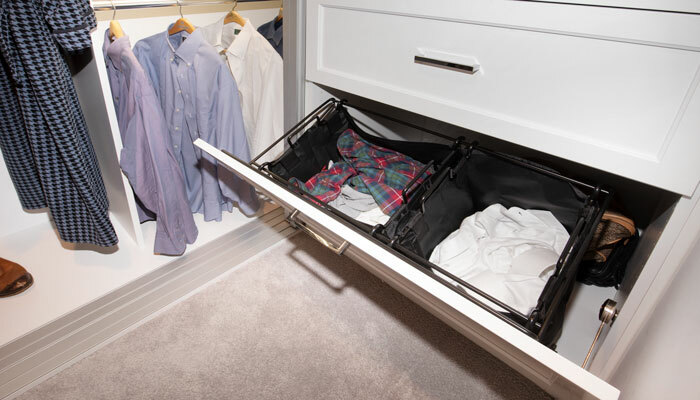 Men's shirts tend to be a bit longer than women's blouses, so you will want to leave adequate vertical space under the closet rod to ensure that articles of clothing do not touch the floor or shelf when hung. 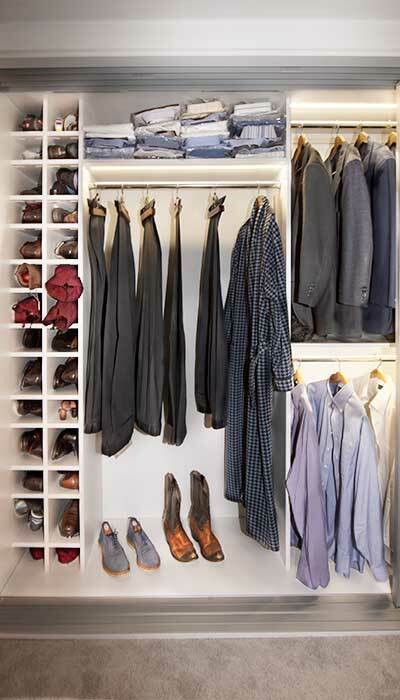 A man's closet will need at least 42 inches for each double hang section of closet organizer. This means that two stacked sections will equal 84 inches — the full height of a typical closet system. For my own husband, who is rather tall, I increased the spacing to 45 inches to ensure that his suit jackets wouldn't touch the shelf below. That brought the total height up to 90 inches, leaving only six inches space between the top of the closet rod and our eight foot ceiling height. Unless the closet has unusually high ceilings, there will be no room for any shelves above the double hang section in a man's closet. 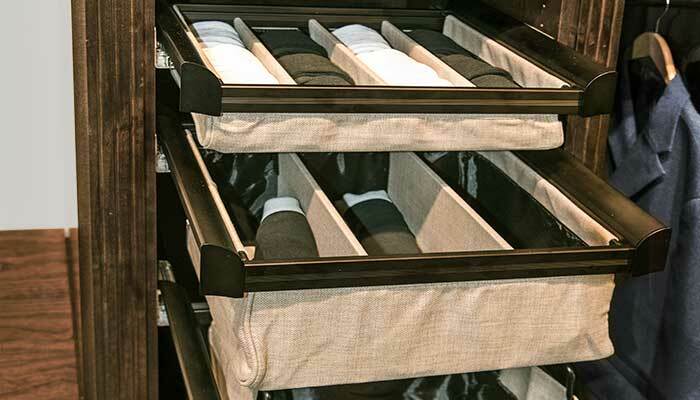 Organize underwear with drawer dividers. Don't let items like socks succumb to becoming a messy jumble. 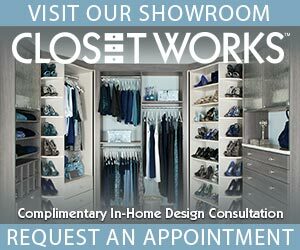 Plan on including a closet island or closet hutch with drawers in your men's closet design. Drawer dividers and drawer organizers will keep the small essentials neat, orderly and easy to find. 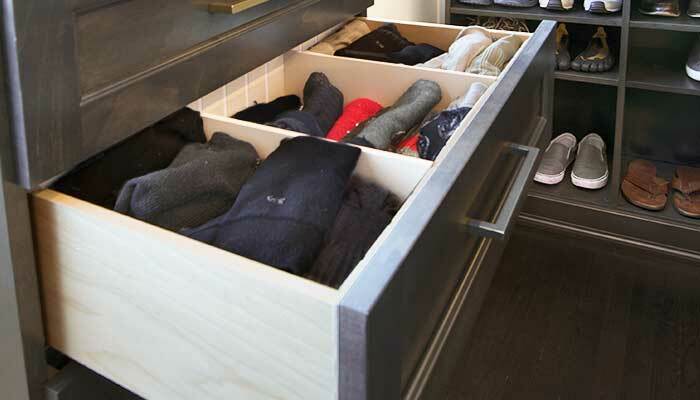 If you don't want to end up wearing one black sock with one navy sock, drawer organizers are an essential part of the successful closet design plan. Drawer dividers are not just for socks. Include enough closet drawers with organizers for all your smalls and underwear. 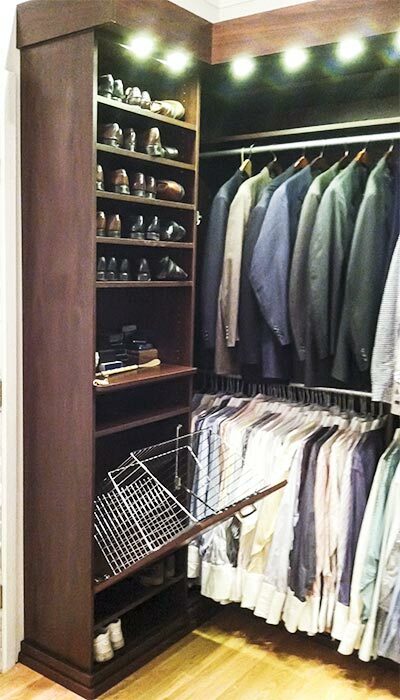 Men's closet organization system with double hang, closet shelves and shoe tower in the corner. A man's closet should include some shelves for storage of folded items like knits and sweaters. The shelves, however should not be located above the double hang section unless the ceilings are exceptionally high. Place the closet shelves next to the double hang, on it's own wall, or above a closet hutch or dresser. You could even include shelves as part of a closet island. As an added benefit to installing a closet island with shelves instead of all drawers, shelves are less expensive and will bring the total cost of your closet down. Use racks that are specially designed to organize men's fashion accessories, like this sliding tie rack and sliding belt rack. 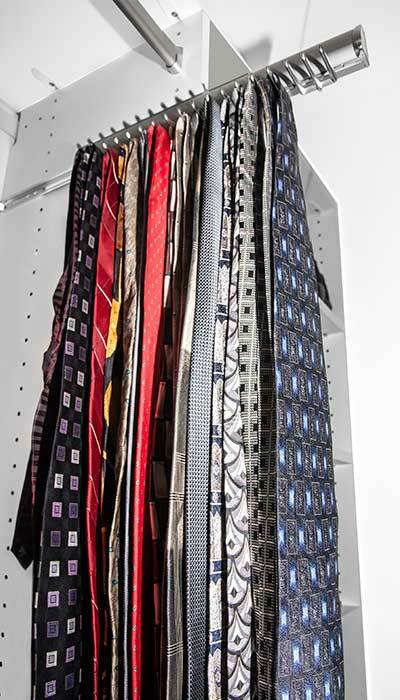 Proper organization for ties and belts is essential in a closet design for men. There are numerous special racks and hooks designed to hold belts and ties. Use them. They will keep your ties wrinkle free and your belts easy to find when you need them. Additionally, many men find that jewelry drawer organizers installed in a closet drawer are the perfect way to organize sunglasses, watches, cufflinks, tie clips and even tie stays. 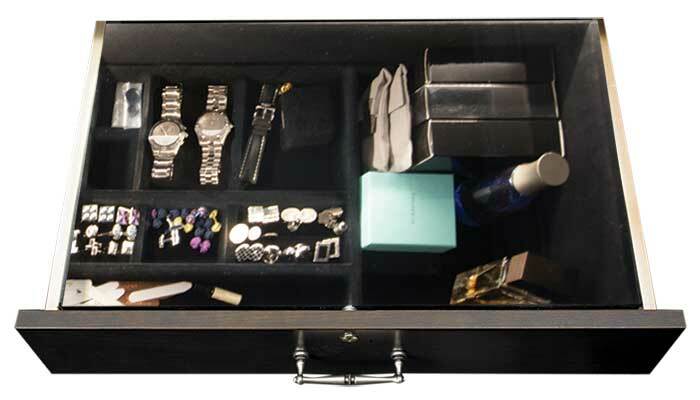 Velvet jewelry drawer organizers are not just for women's jewelry collections. They are handy for men's accessories too. Built in closet hamper with two removable compartments for sorting laundry and dry cleaning. Every well appointed men's closet should include some sort of built in hamper system. In order to stay completely organized, it is preferable to have two hamper bags or units so that regular laundry can be separated from the items that need to be taken to the dry cleaners. This will ensure that items that aren't supposed to get wet with water are not accidentally thrown into the washing machine. Built in hampers with removable hamper bags or hampers with removable liners are preferrable, because they make it easy to transfer dirty clothes from the closet to the laundromat. Mens closet organization tips include good shoe storage. No man should forget about good shoe organization for his closet. These days, every man has multiple pairs of shoes in multiple colors, even if it is only to distinguish casual footwear from dress shoes. Whether you are wearing trendy Air Jordans or traditional oxfords, you will want dedicated shelves or racks to keep them organized and off the floor when you are not wearing them. 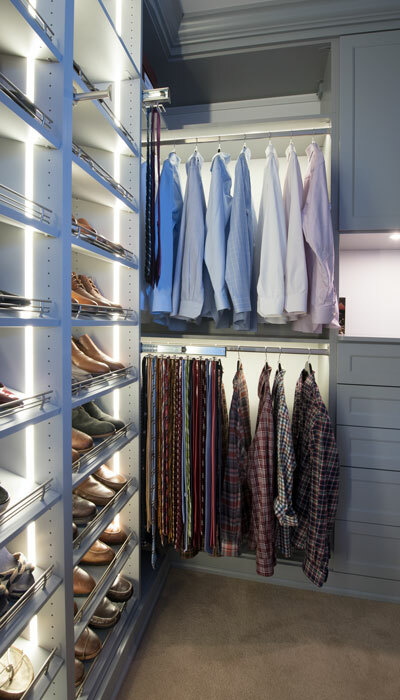 Mens closet with LED closet lighting system to illuminate the hanging and upper shelving areas. Ever since the introduction of the LED light for residential use, the popularity of closet lighting systems continues to grow. Whether it be LED rope or tape lighting that is used under shelves and along cabinet walls or the more traditional puck fixtures, closet lighting systems have taken the country by storm. They offer a more even light source than a simple overhead bulb and illuminate the clothing better. A man with a closet lighting system need never wonder whether he just grabbed his navy blue jacket or the black one by mistake. 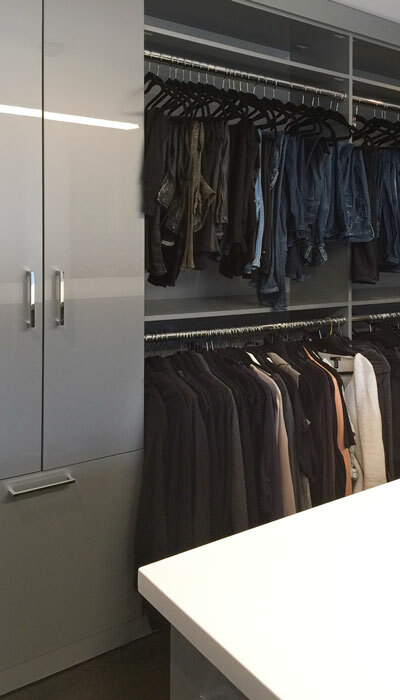 Cost effective as well as practical, closet lighting should be a "must have" feature of every successful closet design plan. 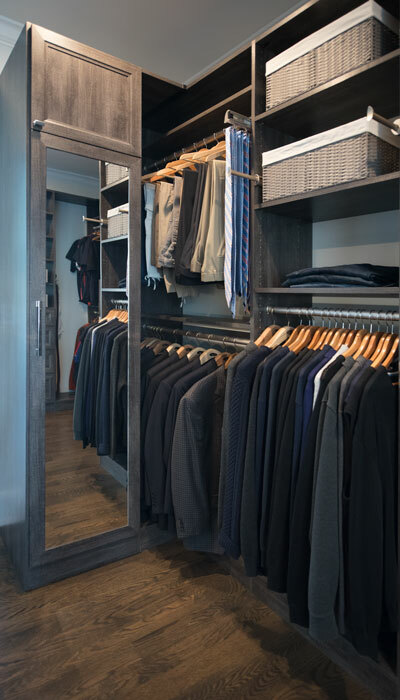 Whether it's built for a business man with a lot of professional clothing or your "jeans and a sweater" kind of guy, the successful mens closet design is a well organized space that is optimized for the individual owner's attire. It includes a lot of double hang closet organizers and little to no long hang closet organizers. The double hang areas are all at least 42 inches high, as men's clothing is longer than women's. 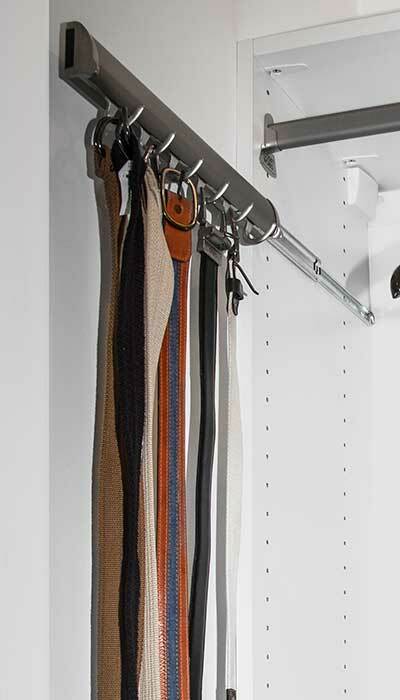 Medium hang closet organizer sections are used to store trousers hung from the cuff or waistband. Folded pants and jeans go in the double hang areas. Shelving for folded sweaters and knits is always included as part of the well appointed men's closet. Dividers and organizers for small items like underwear are used in the closet drawers to keep things tidy. Special hanging racks and organizers for accessories keep ties and other items handy and wrinkle free. The closet hamper should be capable of separating the wash and wear laundry from the dry cleaning. Footwear storage, in the form of special racks or dedicated shoe shelves, are present to keep shoes organized and off the floor. And lastly, the successful man's closet design will be well lit. 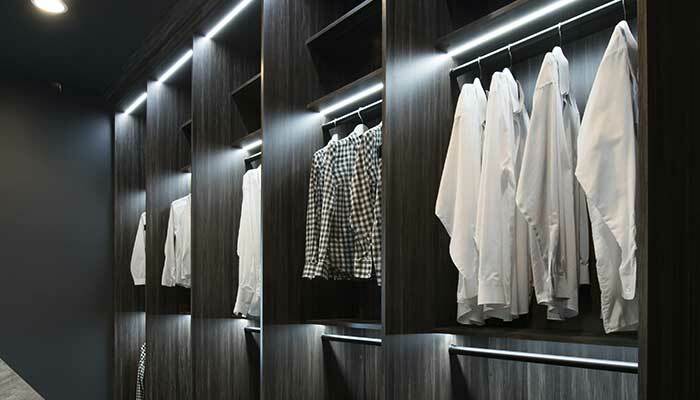 It takes advantage of the new advances in LED closet lighting systems to fully display the wardrobe stored within.